How to sketch portraits. In this post, I did a portrait drawing with step by step tutorial, quick sketch. It’s been a while since I sketch any portrait study so I thought I will sketch a really quick one this morning. The video has three parts. They will explain to you how to sketch portrait easy way. I was going to do a video tutorial for how to sketch portrait, but there are so many of them already on the blog and the premium tutorials. So I decided not to record a tutorial. It is a lot easier drawing or painting without a screen capture and a timer to distract me. 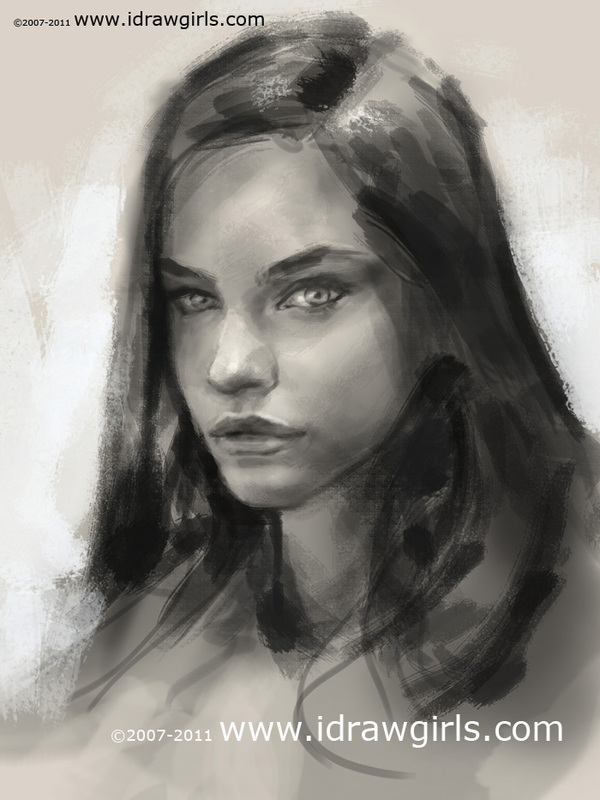 Anyway, there are many similar portrait tutorials on this blog. The way to construct the face I use are that not much different. Some people ask me, how to draw a different looking faces? I would suggest that the way faces can look different it is because of the shape of eyes, nose, eyebrows, lips and shape of face itself. Other than the different shapes or looks of the elements, there are also placement factor. You can use the same looking face, but if you relocate eyes, nose, or lips in just slightly different location. You will have a new different looking face. Here are a few portrait drawing tutorials some with Video drawing tutorials with longer step by step images tutorials on the blog. Also I need to draw and paint more monsters and Mech as some of the viewer suggested that I have not done any Mech or Mecha drawing in a long while. So hopefully I will have some more time to do quick sketch daily. There are so many things to be done and I wish I could just draw and painting without having to do the website and record tutorials at all. I should have some robots to take care of the secondary elements I have to deal with. Anyway, below is a short tutorial for quick portrait sketch. Also another one with the same angel but different portrait study. Below are step by step drawing female portrait. You are just adorable and I’ve learnt a lot from this site. Thank you so much! How cool is this site? I’ve recommended it to everyone! Look around there are more tutorials on the blog. Peace! You seriously didn’t show how to make proportions as if you’re drawing it from real life.